With two brackets of voting, there's still a ways to go in the tourney. Open now for your perusal though, is bracket 'A'. The next round will be open from May 3rd to the 10th. That one features the second half of the prelim voting. Once all the voting is wrapped from the sweet 16, all this hot cover choosing action will move on to the elite 8 quarterfinals which will run from the 11th of May until the 23rd. The semifinals follow that from the 24th through the 28th and the cover boy himself will be chosen at the end of the finals - May 29th to June 4th. The unveiling of the cover (and of course the winning athlete) will take place on June 20th at the Wynn hotel in Vegas baby! Want to be a part of the festivities? 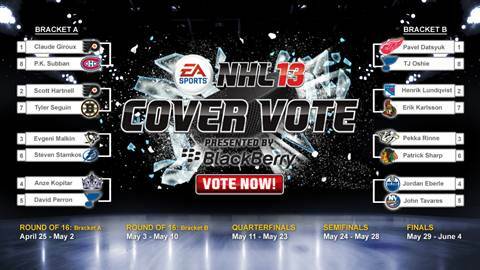 Head on over to nhl.com/covervote and pull that lever as early and often as you feel like.